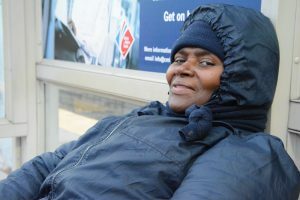 Customers, like Charlotte, depend on Metro transit every day to get to work, school and other important destinations. We hope you enjoy her story, and we’re interested in your transit story too. Email mrhibbard@metrostlouis.org, and we may share your story in a future “Passenger Profile” blog. Charlotte has been riding Metro for “many many years,” and she has come up with a system where she uses different bus routes for different tasks. For instance, Charlotte prefers to start her day at a local breakfast shop, and she rides the #4 Natural Bridge to get there. If she’s interested in doing a little shopping at a local Ross Dress for Less store or Walmart, Charlotte will board either the #2 Red or #57 Maplewood-Wildwood via MetroLink. Charlotte depends on MetroBus and MetroLink to get her around the St. Louis region. She doesn’t own a car, but with Metro, she doesn’t have to let that stop her. Charlotte purchases a monthly pass to allow her unlimited travel around town. She enjoys reading and listening to music on the train and bus.